In this regular series, we shine a spotlight on a London neighborhood to uncover its highlights and hidden gems. This week, we travel south of the river to Brixton to explore its best bits, from its thriving food scene to its cultural institutions. 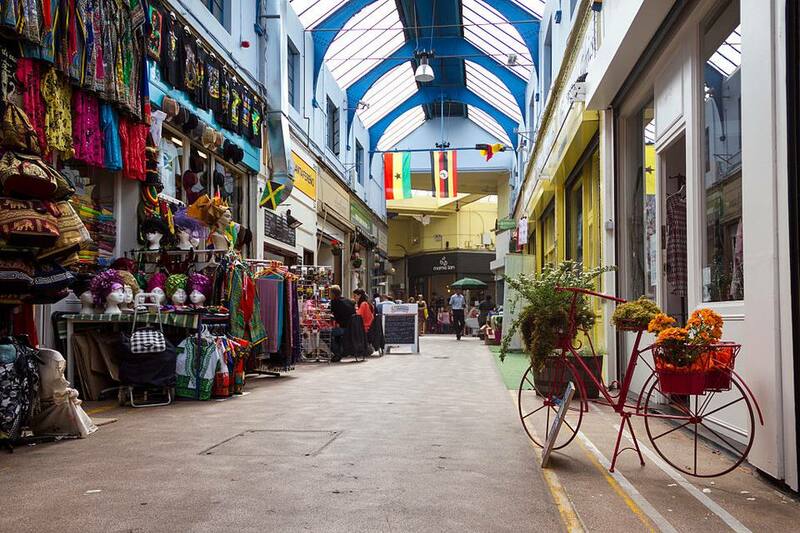 Occupying a historic covered market, Brixton Village is a popular spot with London foodies. Over 100 local and independent businesses line the ramshackle shopping arcades selling everything from clothes and homeware to art and fresh produce but it's the restaurants that draw the biggest crowds. Highlights include ​Mama Lan, a tiny dumpling cafe that serves northern Chinese street food; El Rancho de Lalo for hearty meat-based Colombian dishes; Okan for Japanese pancakes and street food and Franco Manca for top-notch sourdough pizzas. Brixton council commissioned a series of murals in the area in the 1980s to brighten up the once run-down streets. Since then, the neighborhood has attracted top graffiti artists to make their mark including Jimmy C, Space Invader, and Louis Masai. Spot colorful works in and around the market, the railway arches and at the skate park. David Bowie was born on January 8, 1947, at 40 Stansfield Road in Brixton and attended Stockwell Primary School just down the road. A Ziggy Stardust mural opposite the tube station serves as a tribute to the local legend and became something of a shrine after his death in January 2016 as fans laid flowers and candles in front of it. You can pick up a souvenir at the Brixton Pound shop, a local currency initiative that sells £10 notes emblazoned with Bowie's face. Founded by French chocolatier, Isabelle Alaya, the Chocolate Museum is the only one of its kind in London and offers an insight into chocolate making in the UK. It features memorabilia from various producers and merchants and hosts workshops, drop-in chocolate making classes, and regular demonstrations. Don't leave without sampling some of the good stuff in the cafe which serves hot chocolate, cake and all manner of chocolate products. It's hard to believe but Brixton was once surrounded by farmland and formed part of rural Surrey. The magnificently restored windmill on Brixton Hill is a nod to its agricultural past and dates back to 1816. It produced stoneground flour until 1934 and lay derelict for years until it was saved by a Heritage Lottery Fund. After a huge renovation project, it re-opened in 2011 and now offers monthly guided tours and community events. One of south London's oldest cinemas, the Ritzy first opened in 1911 and is a Brixton institution. It screens an eclectic mix of big blockbusters, indie films, cult classics, and documentaries and there's a regular program of quirky events including yoga, quiz nights and live music. Grab a pre- or post-film drink at the ground floor cafe or up on the first floor at the bar overlooking Windrush Square. In a former 1920s theatre, Brixton Academy is a top spot for live music and has played host to The Smiths, Madonna and The Clash. On a much smaller scale, the Windmill just off Brixton Hill is a great place to discover new bands. The Prince of Wales is a multi-floored bar and club with a huge outdoor rooftop terrace and an Art Deco dancehall with a sprung wooden dance floor. Phonox is the coolest club in town for house, techno, and bass. Check out the basement bar for a drink beforehand. The Black Cultural Archives on Windrush Square is a museum that celebrates the history of black people in Britain. Founded in 1981, this heritage centre is home to a permanent collection of personal papers, rare books and photographs and hosts a changing program of temporary exhibitions and events.